Tucker announced the addition of Luimoto to its portfolio of motorcycle street product offerings and welcomes them to the Tucker brand partner family. Luimoto creates authentic motorcycle seat covers designed to enhance the look of street motorcycles and premium gel seat inserts. Luimoto designs and manufactures its products in-house utilizing computer-aided design and a computer-controlled CNC cutter to ensure the highest and most consistent quality available. All Luimoto products are designed and manufactured in North America. Luimoto Designer Seat Covers: Each seat cover is designed uniquely for the motorcycle. Every line and curve of the motorcycle is considered when the seat cover is designed, perfectly complimenting the overall aesthetics. 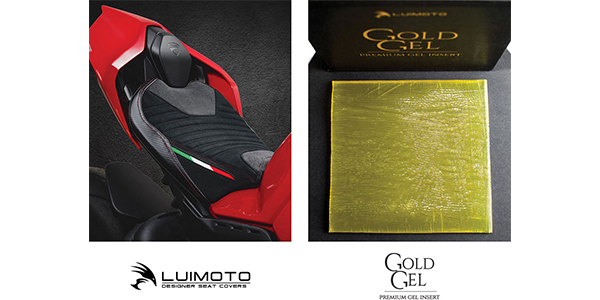 Luimoto Gold Gel Premium Inserts: Gold Gel is specifically designed to absorb and distribute road shock and vibrations. This leads to less rider fatigue, resulting in longer ride times. Gold Gel is not a soft material like most gel inserts on the market, which means it will not bottom and provide a comfortable and supportive ride at all times. Luimoto products are available exclusively from Tucker. More info about the brand and its products can be found at luimoto.com.